NEC has unveiled two new LED-backlit LCD displays for small to medium sized businesses, aimed at providing affordable energy-efficient monitors in the work place. The MultiSync E243WMi-BK features a 24-inch LED-backlit LCD display with an aspect ratio of 16:9 and a native resolution of 1920 x 1080. It employs a premium-grade AH-IPS panel and comes with an ergonomic stand that can be adjusted. There are built-in multimedia speakers, and connections include DisplayPort, VGA and DVI-D. It is also touch-integratable. The 17-inch AS172 packs many of the same features as the larger model, but also comes with Rapid Response technology for watching high-speed, full-motion video without disruption or distortion, and a power manager system with carbon footprint meter and off timer designed to improve energy efficiency. The addition of mercury-free LED backlighting reduces energy consumption of the displays by 34 per cent for the E243WMi and 50 per cent for the AS172. Both versions are ENERGY STAR 6.0 and TCO 6.0 compliant, and have a silver rating with EPEAT. 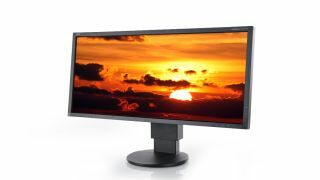 "The MultiSync E243WMi and AccuSync AS172 give people in a variety of professions great monitors with which to perform their work and realize their objectives, all at affordable price points," said Kevin Christopherson, Director of Product Marketing for Desktop Displays at NEC Display Solutions. "LED backlighting and a host of other environmentally sound features like a carbon footprint meter speak to NEC's leadership in environmentally friendly displays." The E243WMi and AS172 launch this month for $259 (£159, AU$290) and $149 (£91, AU$167) respectively. Both include a three-year parts and labour warranty.